It was a long time in coming, but UMD has made the transition. Back in mid December I distinctly remember a conversation with a long time friend about where the Bulldogs were headed. At that time UMD had seven losses with at least one coming per weekend. The conversation went to NCAA Tournament chances and crossing the line, the line of double-digit losses. When the number of losses crosses the line, you have to look at many factors such as the calendar and opponents to name two. If the line would have been crossed in late December or early January, as UMD was projected to when my conversation occurred, it would have been a clear marker of a middle of the road team not destined for post season games. Projections were incorrect and UMD just crossed the line last weekend while being swept at Saint Cloud. In the meantime, the Bulldogs have worked their way into the top 16 of the PWR and as high as 11. Now after being swept last weekend and crossing the line, UMD is sitting perilously at #16 and facing #11 North Dakota this weekend. North Dakota also crossed a line last weekend also in sweeping Miami; they moved into the top 16 of the PWR. 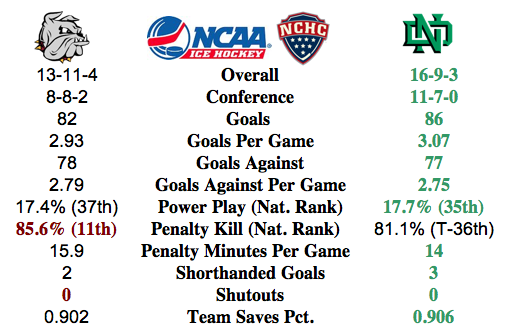 UMD has a chance to help UND cross the double-digit loss line with at least one win this weekend. The Bulldogs still have a high number of penalty minutes per game, but opponents are averaging more at 16.1. UMD is scoring more than a goal per game less at home this season, 2.25, compared to 3.44 on the road. Picks by @afiskness. One poor weekend and the Bulldogs find themselves going from second and having a good shot at winning the Julie and Spencer Penrose Memorial Cup to fifth and battling for home ice in the playoffs. Hopefully the team can get a good start against North Dakota. I think this is looked at as bigger weekend by the players and we will see a better all around effort. North Dakota @ Minnesota Duluth: Bulldog fans can hope that Miami gave up last weekend allowing the big goal scoring by North Dakota and that Duluth laid the egg and are now back on the straight path. This weekend is a close to a coin toss, I will say split. St. Cloud @ Miami: Last Saturdays loss for the Redhawks was probably an eye opener for the team. However there are no cupcakes in the NCHC, so I don't think they can get this thing turned around this weekend. I could see a slight let down by the Huskies maybe leading to a tie one of the games, but I will go with a Huskie sweep in Oxford. Nebraska Omaha @ Western Michigan: This is another coin toss, both of these teams you just don't know who is going to show up. No real between the pipes talk here and will go with a split. Colorado versus Denver (home and home): The Tigers have been playing much better recently and will definitely be up for this series. Denver has been streaky and struggles to score at times. With the home and home this looks like a split.